Submitted by Norm Roulet on Sat, 08/14/2010 - 18:24. As a mid-2010 update on the progress of realNEO.us informing and interconnecting the virtual world, I post here some Compete.com analyses through July, 2010, featuring the visits from within the United States (about 20% of realNEO traffic is international) to realNEO.us versus what seem to be the most comparable local news and information "media" sites - above featuring the non-commercial, donation-funded, cooperative-owned and -managed, $0 overhead realNEO.us versus heavily funded and promoted corporate commercial media sites Cleveland Scene, Crain's Cleveland, Cool Cleveland and Lakewood Observer. Compete.com reported realNEO had the fastest growth rate for visits, at +332.39% over the year... +36.44% increase in July over June. Our Google Analytics data shows different but similar results - I think Compete.com has a good lock on our traffic trends now - if not exact levels, useful none the less. What I have observed about our traffic is that it is far lower than it should be. As we grow our site administration resources we shall focus more attention on our search engine optimization (Drupal makes that easy), linking (getting global makes that work), and traffic analysis (just a matter of getting serious about analyzing our world), as the content and activity of realNEO is world-class and deserving of greater global awareness and reach - that is achieved by telling the world about realNEO. I predict by this time next year our traffic to realNEO will grow 10X if not 100X or more... and I'll keep you posted on that. 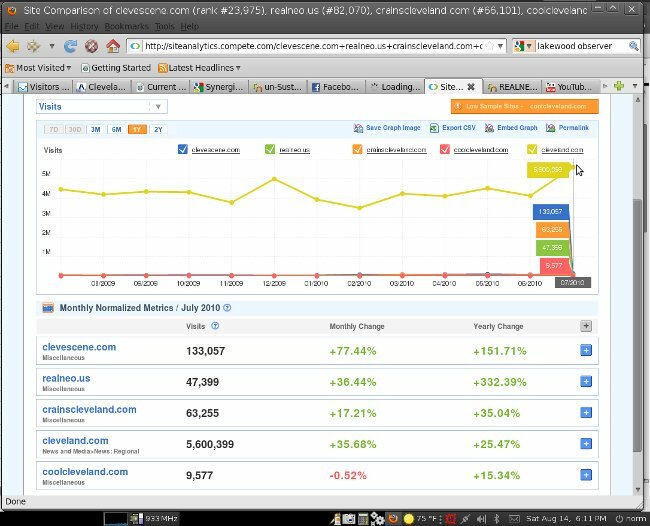 With over 100X growth, we will exceed the traffic to Cleveland.com, and I expect that will happen within 2 years. 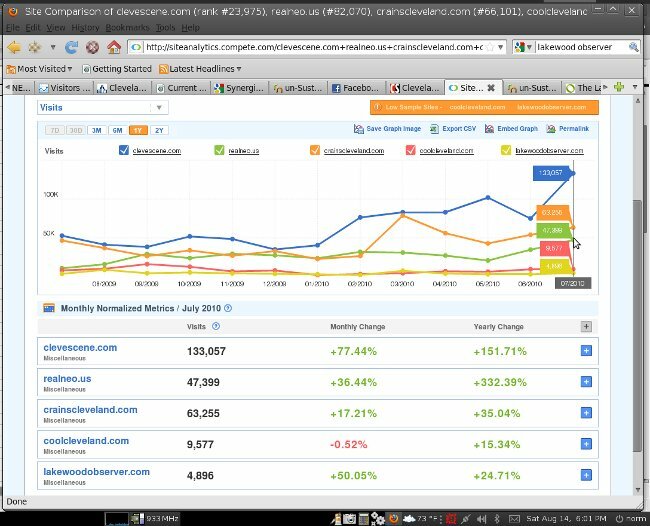 The compete.com chart below is without the Lakewood Observer, and adding Cleveland.com (The Cleveland Plain Dealer). This chart shall look very different for 2011, I guarantee. Compete is committed to providing marketers with the most actionable digital intelligence in the industry. What are the strengths of Compete's data? How does Compete protect the privacy of its panel members? Why is it important to have a large panel? How does Compete estimate site traffic? How are Compete metrics different from Alexa, comScore, Hitwise and Nielsen/NetRatings? Why are diverse panel sources important? What is the value of precise Unique Visitor estimates compared to rankings and shares? Why doesn’t Compete's estimate of site visitors match my local analytics? How are Compete Unique Visitors counts different than Unique Visitors reported by log files and local web analytics tools? How does Compete normalize its data? Why do Compete data not include international Internet users? How does Compete measure the web sites it reports on, why can’t I see my site? What are the strengths of Compete’s data? Compete’s clickstream data are collected from a 2,000,000 member panel of US Internet users (about a 1% sample), using diverse sources. Using a rigorous statistical normalization methodology, Compete creates precise projections of the behavior of the entire US Internet browser population on monthly and weekly basis. In addition, Compete provides daily estimates of share of consumer attention garnered by the top Internet sites and the velocity of change of this attention. Compete is the only commercial web analytics provider to make its data freely available online for all Internet users. Submitted by ljhg on Mon, 08/16/2010 - 21:25. Cleveland Challenger -" the boldest newspaper anywhere in Ohio" - dynamic and no advertising - good job Mayor Brewer!